Al Kimel, blogmeister of Pontifications where I am a co-writer, has decided to close down the combox as he prepares for ordination as a Roman Catholic priest. I have expressed my view of that move in a post over there today. Let me express my thanks to him once again. The Catholic priesthood will gain strength from his presence therein. Starting next week, and as Al's subsequent posting permits, I will be hosting comments on his posts right here at Sacramentum Vitae. While he may offer comment himself from time to time, the burdens of moderating debate will devolve to yours truly. I hope that many of those who enjoyed and learned from Pontifications will continue doing so here. For obvious and not-so-obvious reasons, today's date is a specially important one to me. It seems to have been St. Michael the Archangel's feastday from the earliest Christian centuries in Rome. Although the Catholic Church has combined the feast with those of the archangels Gabriel and Raphael, thus honoring the "Big Three" mentioned in the Bible, even now the Anglicans call today's feast "Michaelmas. "The name itself signifies. The original Hebrew meant "he who is like God;" in Christian traditon, that description morphed into a question: "Who is like God?" which in turn was held to be Michael's battle cry as he and his host ejected Satan and his host from heaven for a mass rebellion motivated by Satan's claim to God's throne. Thus Jesus said: "I saw Satan fall from heaven like lightning" (Luke 10:18). Now I know there are plenty of biblical scholars who explain that away, in context, as nothing but Jesus' approbation of the work of "the seventy-two" in rolling back evil. It was that, to be sure; but frankly, I don't buy the reductionistic 'nothing but' and have never been able to. With Tradition, I believe that Jesus was also describing what he witnessed in illo tempore, as God the Son, before his incarnation as a man. His copious talk of and conflict with Satan in the Gospels strongly suggest that the two go way, way back: further back than we can possibly imagine. God appears to have given Michael the place of honor once held by Lucifer, now Satan. As such, Michael is commander-in-chief of the angelic hosts and champion of the Church Militant on earth. Many other roles, revealed in apparitions and miracles, have also been attributed to him. Google him, read about him, and learn. This saint is incalculably important, as are angels generally in the "economy" of salvation.Some people are put off by the fact that he and the other archangels are called 'saint'. After all, Rome hasn't vetted and canonized any such being! That betrays a misunderstanding of the word. The lower-case 'saint' comes indirectly from the NT Greek hagios, meaning 'holy one'; the Latin for that is sanctus, the root of the Old French and Norman saint. Any "holy one" is a saint, even if the pope doesn't know it and say it. All the good angels are saints; they dwell in God's presence and do his bidding. Indeed, the very term 'angel' comes from the Greek for 'messenger'; in the Bible, that role is the most common one attributed to angels for the benefit of human beings. I am devoted to St. Michael as protector, guide, and hopefully as healer. The Bible readings from today's (Roman) Catholic Mass got me onto one of those meditative jags that I make bold to ascribe to the Holy Spirit. I name him as the source because the core thought typifies God's ironic, paradoxical sense of humor: the wisdom that soothes is the wisdom that hurts. One cannot but see the Cross in that. "You who would destroy the temple and rebuild it in three days, save yourself, if you are the Son of God, (and) come down from the cross!" Likewise the chief priests with the scribes and elders mocked him and said, "He saved others; he cannot save himself. So he is the king of Israel! Let him come down from the cross now, and we will believe in him." Of course Muslims are no more if no less "wicked" than any other group—including, unfortunately, Christians. But Islam's rejection of the Cross indicates a profound difference between Islam and Christianity, and what makes Islam different in this respect is the wisdom of the world, not of God. By contrast, says a verse from today's second reading, "the wisdom from above is first of all pure, then peaceable, gentle, compliant, full of mercy and good fruits, without inconstancy or insincerity" (James 3:17). Such wisdom comes from the Holy Spirit dwelling in us. Since it is based only on love not fear, it does not exert power in self-defense, does not compel, and arises from no ulterior motive. It lets itself be nailed to crosses small and big. The person who receives and cultivates such wisdom is a sacrificial offering for others. He feels the weight of it but, for the most part, does not make us feel it too, as somebody with a martyr complex would. (We all know such people.) For the most part, such wisdom manifests itself as the quoted verse says. It is "first of all pure," by which is meant what Kierkegaard meant when he asserted that "purity of heart is to will one thing." The one thing the wise person wills is fellowship with and conformity to the primoridal Wisdom, the Logos, Jesus Christ. As today's Gospel indicates, that comes at almost unimaginable cost. Being an offering for others sooner or later carries the ultimate price. The wisdom that soothes others is the wisdom that hurts us. Given what fallen humanity is like, that could hardly be otherwise. It's the truth behind the saying "No good deed goes unpunished." Whatever form it may take, the "punishment" is part of the deed—indeed the consummation of the deed: "It is finished." That happens in mostly small ways, and we will each die well to the extent we are faithful in those small ways. Indeed, as a total emptying of self for God and others, the punishment cannot remain punishment. It is redemptive, and thus a prelude to that glory of which Jesus' resurrection was the prime instance and cause. And that's why worries about status and power are so silly; why "[i]f anyone wishes to be first, he shall be the last of all and the servant of all." That is only possible if we receive, identify with, and emulate the "little child" in ourselves and others, symbolized by the child whom Jesus took in his arms with the words: "Whoever receives one child such as this in my name, receives me; and whoever receives me, receives not me but the One who sent me.” The wisdom from above may not consist in such littleness, but it cannot only be received in such littleness. For only in such littleness can we escape the "wisdom" of the world and be filled by the Spirit with that of the Logos himself. A way to orient ourselves that way in daily life is to ask ourselves: are we after control or the Cross? Fr. Martin Fox explains it well. I can't let this day end without marking the feast of one of the Church's most extraordinary saints, Padre Pio of Pietrelcina. To my substantial post on last year's feast, I add my request that he be the spiritual father of those whom I love, especially my children. It's just one of the ways to compensate for my inadequacies. 1. The Pope gave this speech to European secularists knowing full well that Islamic extremists (that is, a sizable portion of Muslims in both Europe and the Middle East) would react to the speech in an uncivil manner. Their uncivil reaction would highlight to those European secularists who heard the speech or read it that the secular European world and the Catholic intellectual world share something in common that is not shared with them by the Islamic world in general - civility and a cultured intellectual reserve. By highlighting this the Pope suggests in a subtle manner that this shared civility may just have something to do with a common intellectual heritage - the synthesis of Christian and hellenic thought which is found in the intellectual patrimony of Europe. 2. If "1" is true then we might view the Pope's speech as a brilliant rhetorical devise used to attempt to reestablish a common intellectual bond between the European university (or European intellectuals in general) and the Catholic Church in the midst of a Europe which is increasingly being Islamicized. This is a very subtle way for the Pope to remind Europeans that even as secularists they have more in common with Catholic Christianity than they do with Islam. This may seem an obvious point, but in today's Europe it is not - many secularists instinctually feel some resonance with Islam due to their shared hatred of Christianity. Thus if one can present Christianity as a reasoned, intellectually reserved and cultured form of thought which is quintessentially European at the exact moment that the Muslims in the midst are waving their "death to the infidels" signs then one has just effectively changed the former "us vs. them" to a new alliance of "us vs. them." I believe that this is exactly what Pope Benedict intended with this speech. Yesterday I promised a post "analyzing" Pope Benedict XVI's Regensburg speech that set the Umma off once again. Herein I shall keep that promise. But first I note that, also yesterday, a friend of mine e-mailed the recent photo at the left. I hope that many of you get the black humor. If you do, you know that the main point of the Pope's remarks is irrefutable. 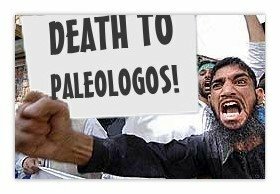 For those who don't, I point out that the man whose death is being called for by the devout Muslim holding the sign, namely the Byzantine emperor Manuel II Paleologus, has been dead for nearly 600 years. (To be charitable, I'm willing to allow that the demonstrator wants to emulate how one ninth-century pope treated his dead predecessor: he had the body disinterred, tried before a mock court, convicted, mutilated, and dumped into the Tiber. Plays to the gallery pretty well.) It was the Pope's citation of a remark made by Emperor Manuel which occasioned the latest paroxysm across the Umma, in which of course have been heard not a few threats on the Pope's life. Such threats are now understood to be a matter of course when somebody offends Muslims. We've learned the ground rule for dialogue: "Islam has been a religion of peace since 622; say otherwise and at least one of us will feel obliged to kill you." But it is well nonetheless that the Pope cannot unsay what he said. His choice to quote the Emperor was doubtless very carefully weighed to make a point that desperately needed to be made but also required plausible deniability from such a globally important figure. Many otherwise sympathetic people have taken the Pope to task for that. But they forget the significance of the fact that the very uproar he caused proved his point. Which is what? Like everything the Pope says to or among academics, of which he was a star, the point is not immediately obvious. Perhaps the best way to unearth it is to consider how Benedict praised his old university. [It] was also very proud of its two theological faculties. It was clear that, by inquiring about the reasonableness of faith, they too carried out a work which is necessarily part of the "whole" of the universitas scientiarum, even if not everyone could share the faith which theologians seek to correlate with reason as a whole. This profound sense of coherence within the universe of reason was not troubled, even when it was once reported that a colleague had said there was something odd about our university: it had two faculties devoted to something that did not exist: God. That even in the face of such radical scepticism it is still necessary and reasonable to raise the question of God through the use of reason, and to do so in the context of the tradition of the Christian faith: this, within the university as a whole, was accepted without question. Such a vision of faith and reason is not only quintessentially Western but universally valid. Whether or not we believe we have a true answer to "the question of God," theology is a reasonable discipline, fit for a university, because the questions theology considers are reasonable ones meriting the most assiduous inquiry. But within both religious and secular culture, there has long been a certain theological tendency undermining the role of reason in the life of faith and in society as a whole. To philosophers, the most familiar label for that tendency is voluntarism. In theology, voluntarism in its strong form is the notion that divine sovereignty is so absolute that God is not bound by anything at all—not even his by own goodness, and not even by reason itself. God wills what he wills what he wills: if he wills that good be evil and evil good, then it is so; if he wills that contradictions be true, then they are true. In Catholicism, certain late-medieval thinkers such as William of Ockham and Nicholas of Cusa were strong voluntarists, as have been not a few Protestant thinkers since. All that is old hat to philosophers and theologians, and the Pope alluded to it right after his discussion of the Emperor's words. But the striking thing about the lecture is the connection drawn between Muslim and Christian voluntarism, and how each relates to the problems of today. In the seventh conversation-controversy, edited by Professor Khoury, the emperor touches on the theme of the jihad (holy war). The emperor must have known that Sura 2, 256 reads: "There is no compulsion in religion". It is one of the suras of the early period, when Mohammed was still powerless and under threat. But naturally the emperor also knew the instructions, developed later and recorded in the Qur’an, concerning holy war. Without descending to details, such as the difference in treatment accorded to those who have the "Book" and the "infidels", he turns to his interlocutor somewhat brusquely with the central question on the relationship between religion and violence in general, in these words: "Show me just what Mohammed brought that was new, and there you will find things only evil and inhuman, such as his command to spread by the sword the faith he preached". The emperor goes on to explain in detail the reasons why spreading the faith through violence is something unreasonable. Violence is incompatible with the nature of God and the nature of the soul. "God is not pleased by blood, and not acting reasonably is contrary to God’s nature. Faith is born of the soul, not the body. Whoever would lead someone to faith needs the ability to speak well and to reason properly, without violence and threats... To convince a reasonable soul, one does not need a strong arm, or weapons of any kind, or any other means of threatening a person with death...". The decisive statement in this argument against violent conversion is this: not to act in accordance with reason is contrary to God’s nature. [Khoury] observes: "For the emperor, as a Byzantine shaped by Greek philosophy, this statement is self-evident. But for Muslim teaching, God is absolutely transcendent. His will is not bound up with any of our categories, even that of rationality. Here Khoury quotes a work of the noted French Islamist R. Arnaldez, who points out that Ibn Hazn went so far as to state that God is not bound even by his own word, and that nothing would oblige him to reveal the truth to us. Were it God’s will, we would even have to practise idolatry." Well then: if, as remains common Muslim theology, God is "not bound even by his own word," then there can be no problem about religious violence or contradictions in the Qu'ran. In one sura we read that there's "no compulsion" in religion; in others, we read about all the conditions under which killing "infidels" is justified. This is why Muslims say with a straight face that Islam is a religion of peace and a religion of jihad, violent if need be, against infidels. This is why, though the majority of Muslims are not warlike, they have only weak arguments against those who are warlike. According to them, the Qu'ran is the literal words of God; if God is not bound by his own word, then of course he is not even bound by the logic of his words. But we are bound by his words; so if his words are illogical, then we are bound to be illogical. That's quite pertinent to current events, and quite bad enough in itself. But such unreason is not the only sort of unreason that voluntarism has caused. The West is guilty too, albeit in a very different way. I shall cut to the chase since you can read the lecture for yourself. The Pope's chief complaint is how the West, starting with medieval voluntarism, has ended relegating religion and ethics to the realm of the subjective, which may be interesting and even inspiring but cannot contain objective, rationally knowable truths. The Muslim way of divorcing faith and morality from reason leads to intolerance and violence; the Western way of doing so, which expresses itself as relativism and subjectivism, leads to cultural decadence. It is just such decadence that Muslims most dislike. And it's all the worse because it makes the bulk of contemporary Westerners unable to understand the Muslim challenge and react accordingly. The only way to deal with that challenge is to restore a vision of reality in which religion and morality form part of a unitary vision of truth along with the science of which we are rightly proud. Such is what the Catholic Church continues to uphold—at least among those of her children, like the Pope, who think about such things and are able to appreciate their importance. In such a vision, God is bound by his own goodness and wisdom, which are dimly expressed in our virtues, our logic, and our science. To borrow a phrase from the American Declaration of Independence, science helps us understand "the laws of nature"; religion and natural morality help us to understand "nature's God." Together, they all form a unitary vision of truth. And it's one that excludes violence aimed at enforcing religious tenets. It took Christians quite a long time to learn that. Most Muslims have not yet learned it. That is the main point of the Pope's lecture. It ought to be obvious. Too bad it isn't. Are we cowards or men? Reaction in the Western media to latest Muslim paroxysm of rage—a collective tantrum provoked by a wonderful lecture of the Pope's that I shall analyze in my next post—has got me asking myself a question that ought to trouble thoughtful people: do men any longer outnumber cowards in the West? It is by my own experience that I know the difference between the two. There have been times in my life when I behaved in manly fashion, and times when I behaved like a coward. The biggest failures in my life have been caused by my own cowardice, and I'm still not sure whether I'll die a coward or a man. While I'm doing my best to meet the challenges of my life, and they are not trivial, I cannot take for granted that I won't flunk the next big test out of cowardice. (I'm sure it won't be about principle, of course; I'm too pig-headed for that to be a test worth giving me. My tests have all had to do with loving those hard to love, starting with myself; and I'm sure my next one will too.) But whatever the occasion of the test will be, I've been around too long to presume that much on the grace of God, let alone myself. That is why I don't at all like what I'm seeing in the so-called free world's reaction to Muslim bullying. Consider the contents of a must-read article from the online magazine The Brussels Journal: The Church – Part of the Problem or Part of the Solution? Its sorry account of Western dhimmitude is all the more depressing given how the forces in our society that should be stiffening our spiritual backbone against jihad are those most given to weakening it: the churches. Were it not for my fear of playing armchair psychoanalyst, I'd say they have a collective death wish. The spiritual torpor and ingrained, cultural self-hatred so evident in so many of our clergy seems to me to be causing a desire to surrender to an enemy with far greater spiritual vigor. That is cowardice. I can understand that in agnostics and hedonists, but not in men of God. Yet there it is—the only explanation I can find for the fact that we are apparently expected to walk on eggshells around and about Muslims, so as not to provoke "understandable" reactions that wouldn't be tolerated for a New York minute from others under far greater provocation. Don't believe me? Well, living where I do and reading what I read, I can hardly go a day without seeing or hearing my religion insulted. But if I burned a car in response, I'd do hard time; if I called for the death of the village atheist, I'd have a restraining order slapped on me; if I and my Catholic friends demonstrated with signs like the ones the Muslims have been carrying lately, we'd be dismissed and marginalized as kooks—if we were lucky. I can understand Muslims upholding such a double standard; but from Westerners it is absolutely intolerable, all the more because it's upheld in the name of "tolerance." If one cannot see what's intellectually wrong with moral relativism, just behold the cowardice it causes and encourages. Nobody likes the sight of cowardice, including those guilty of it. Perhaps that's why they're blind to it. If 9/11 wasn't enough to remove their blinders, I shudder to think what would be. Here we go again. This time, the Pope gives a sound, sober, and elegant academic lecture at a university where he once taught, in which he cites in passing a derogatory statement about Islam made by a medieval Byzantine emperor. The purpose of the citation was to illustrate one side of a contrast Benedict wished to describe, one that is found not just in Islam but in the West too. And if you read the lecture, to which I've linked, it is clear that he was focusing much more on the West's internal problem. But because the quoted statement was a negative one about Islam, the Muslims are angry again. Demonstrations have been held all over the world; effigies have been burned and car windows smashed; outraged clerics have called for an apology. We saw this movie less than a year ago over something far less subtle and intellectual: a cartoon in a Danish newspaper. So what else is new? And I ask: so what? For the past few generations, Muslims have been getting angrier all the time. Some Muslims, especially young and unemployed ones in their home countries, are angry that they do not enjoy the freedoms and privileges of the West. Others, immigrants in Western countries, enjoy such privileges while hating what makes them possible. Most Muslims believe that they shouldn't be willing to live with the fact that the rest of the world isn't Muslim. And a small but very well-known minority of Muslims regularly targets and kills innocent people, including Muslims, as part of the jihad or struggle against what they consider the enemies of Islam. 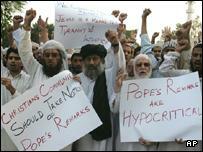 In such a context, it doesn't matter to most Muslims what the Pope actually meant. It doesn't matter that he has called for, and practiced, mutual respect and interreligious dialogue. It doesn't even matter that his view of Islam is much more balanced than that of Manuel II Paleologus, the angry, almost despairing leader of an ever-shrinking Byzantine state which he knew was doomed to extinction by Muslim armies. No, all that matters is that the Pope quoted something negative about Islam. Anybody who even cites something negative about Islam must be, if not an outright enemy of Islam, than terribly disrepectful of Islam. Such, apparently, is the Muslim rule for interreligious dialogue. They may and do say what they like about Christians and Jews, but the latter may not say or even cite anything negative about Islam. Such is the double standard of angry people. Frankly, my dears, I don't give a damn. The choices left us by the Muslim attitude are silence or dhimmitude, and neither is acceptable. The Pope had every right to say what he did. Presumably to calm the waters, he has issued a ritual expression of "regret"; he has to, if only for political purposes. But don't let that fool you. The Pope knows that what I'm saying is true, and he's not going to deny what he actually said, because it too was true. We should not hesitate to say so. 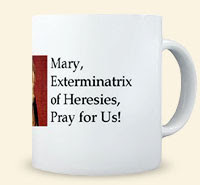 Over at Pontifications, one commenter has envisioned a T-shirt. On the front: “Islam: a religion of peace since A.D. 622″ and on the back, “Say otherwise and we’ll blow you up.” The thing should be said and the T-shirt made. I'd buy it. Of course, only those who want to live should feel free to wear it. What happened to America five years ago today was an atrocity far worse than the Japanese attack on Pearl Harbor sixty years earlier. The latter took about as many lives as 9/11, but its target was military not civilian. It was a conventional act of war against soldiers, not one of mad terrorism against innocents. It lacerated my soul in another way too. At a party in 1975, I danced to the disco sound of "Burn, Baby, Burn!" at Windows on the World, at the top of one of the towers. All I could think of on 9/11 was penance. While both Pearl Harbor and 9/11 roused this country from a certain slumber, there is another key difference: Pearl Harbor was an attempt to break our naval power; 9/11 was an attempt to break our will. The former did not long succeed; indeed, one might say that it roused and stifferened our will to prevail. In the short run, 9/11 failed too. But about the long run I am not so sanguine. Americans and Westerners generally do not, as a whole, seem yet to understand what all the conflict within and about the Middle East has in common. This is not a war about "terrorism," which is only the most obvious weapon wielded by our true enemy. Whether one looks at Iraq, Southern Lebanon, Palestine, Afghanistan, or any place where Islamist terrorism has spilled blood, the enemy is the same: radical Islamic jihadism, whether of the Sunni (Wahhabi) or the Shi'ite variety best represented by Hezbollah and sustained by Iran in Iraq too. The aim of all jihadists is the same: the destruction of Israel and ultimately of the West, making way for the worldwide rule of Islam. While it is quite true, for example, that Saddam Hussein and al-Qaeda had no working connection, the trends throughout the Middle East and Southern Asia, both before and since Saddam, are toward increasing convergence of jihadist groups. Saddam paid off the families of Palestinian suicide bombers of Israelis and tolerated Iraq's homegrown jihadist group, Ansar al-Sunna. The hydra-headed monster had been, and has since been getting, more cohesive for quite some time. One might argue that the overthrow of Saddam and the subsequent Iraqi insurgency has only accelerated that process; but if it has, that is not such a bad thing. It helps prevent people from sleeping too long. Wherever there is Islamist terrorism, one finds jihadists from many different countries joining together. We're seeing only the earliest stages of what will, in due course, evolve into a true "clash of civilizations." Secular tools and outlooks will not avail us. The West will lose if it does not, in Benedict XVI's words, recover its "spiritual roots." I thought I should take note of this day for two reasons. First, it is the anniversary of the ordination of one of my oldest friends. Congratulations to him as he continues his ministry in difficult circumstances. Second, it's a good occasion to mention one of my favorite themes: the most salient area of theology today is ecclesiology. 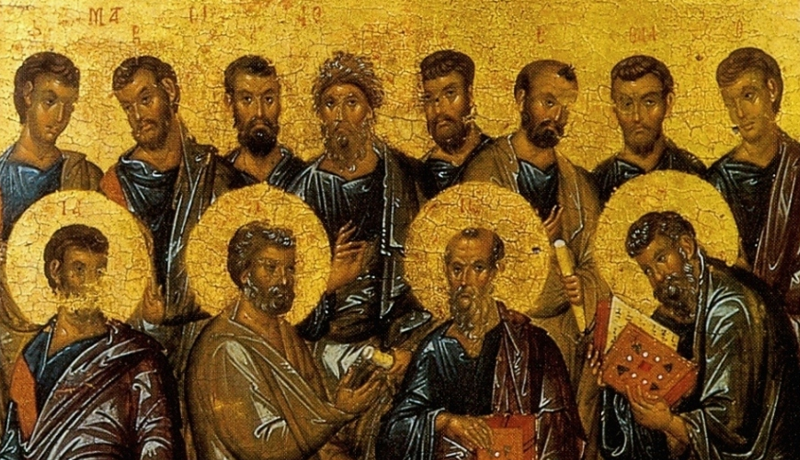 In the case of all the Saints, the Church commemorates their birthday on the day of their return to the Lord. However, in the cases of St. John the Baptizer and the Blessed Virgin, it also celebrates the day of their earthly birth. This is a singular fact already emphasized in ancient times, for example, by Paschasius Radbertus (d. about 859). The reason for this fact is not found primarily in the greatness or the privileges of the persons involved but in the singular mission that was theirs in the History of Salvation. In this light, the birth of the Blessed Virgin is considered to be - like that of John the Baptizer - in direct relationship with the coming of the Savior of the world. Thus, the birth and existence of Mary—similar to and even more than those of the Baptizer—take on a significance that transcends her own person. It is explained solely in the context of the History of Salvation, connected with the People of God of the Old Covenant and the New. Mary's birth lies at the confluence of the two Testaments, bringing to an end the stage of expectation and the promises and inaugurating the new times of grace and salvation in Jesus Christ. Mary, the Daughter of Zion and ideal personification of Israel, is the last and most worthy representative of the People of the Old Covenant but at the same time she is "the hope and the dawn of the whole world." With her, the elevated Daughter of Zion, after a long expectation of the promises, the times are fulfilled and a new economy is established (LG 55). The birth of Mary is ordained in particular toward her mission as Mother of the Savior. Her existence is indissolubly connected with that of Christ: it partakes of a unique plan of predestination and grace. God's mysterious plan regarding the incarnation of the Word embraces also the Virgin who is His Mother. In this way, the Birth of Mary is inserted at the very heart of the History of Salvation (emphasis added). Valentini cites Vatican II's Dogmatic Constitution on the Church, Lumen Gentium, which was concerned to present Mary above all as "Mother of the Church." Within the Church, Mary represents the feminine principle in which we all share as members of the Mystical Body of Christ, i.e. the Church. The Church is one body with Christ because she is the Bride whom he, the Bridegroom, has married. Thus Mary is Spouse of the Holy Spirit as well as Mother of the Son. As her divine Son's most perfect human disciple, filled to overflowing with the Holy Spirit who conceived the Son in her, she leads to the Son by the power of the Spirit all those who seek her care and protection. As personification of the Church, she helps to make the Church as collectivity what she is individually: the receiver and bearer of God in the world. Such is the "Marian charism" of all believers. At the other pole of the Church we have the clerical hierarchy, with the college of bishops as collective head and the pope as head of them. The hierarchy represents the masculine principle of headship and self-immolation that is fully found only in the life, death, resurrection, and divine person of God the Son Incarnate: Our Lord Jesus Christ. As sinners, they fulfill their role quite imperfectly even as Mary fulfills hers perfectly. They and their role exist for the sake of all of us, whom the human person Mary represents. Such is the balance of the Church. The representation of headship, through which Jesus Christ exercises his headship, is done by sinful men; the representation of submission and sanctification, which Jesus also uses for his purpose, is done by a sinless woman. We need to meditate more on such truths today. I could go on, but I don't have time and for now this is enough food for thought. I offer it to you, my readers, and to God for further development. Apologies to my vast readership once again for my month-long absence. I've moved to another city and have been working long hours as a wage slave to pay for that. Which reminds me that today is Labor Day. Though fraught with struggle and violence, the labor movement's origins in the 19th century were on the whole laudable. It had been historically inevitable that the Industrial Revolution would cause massive exploitation of cheap labor, and it was morally imperative that such exploitation be mitigated. Communism was not the answer; and as an alternative, the American labor movement once had considerable success that we still benefit from today. But labor is now in eclipse: the forces of international competition, especially the influence of cheap Asian labor, have put many employers in a very strong position once again. If they don't move production to where labor is cheapest, they cannot price their products competitively and in due course go out of business. So, many jobs are exported overseas, and the pay for many of the remaining ones is forced downward. Such is globalization, which nothing can stop despite the pain and the reactionary longings for an easier past. What is to be done? Right now, not much can be done save at the margins. More and more Americans lack access to adequate health care because they cannot afford it on their own and their employers cannot, for the reasons stated above, afford to provide them with insurance. Indeed, the very concept of employer-based health insurance is slowly but steadily becoming unworkable for all but the highest-paid workers, those in the most profitable industries, and government workers. We desperately need a system of tax-financed basic health care, with anything elective left to the current system and with rationing of services for those past Social-Security retirement age. But that would only be nibbling at the margins, and the force of prejudice against anything smacking of "socialism" is so strong that Americans don't seem ready even for that. In any case, the real new labor revolution needs to be over the very nature of work itself. Even unionized and other well-paid workers tend to view their jobs less as intrinsically valuable than as the suffering one must undergo to obtain money for survival and pleasure. That is how I view my current job, and I have lots of company all over the world. Actually, my position is better than that of many, because at one time I actually did earn my living doing something I love and am young enough to regain that opportunity if I work smart enough in my spare time. But countless people don't have such opportunities. The only solution is to embrace the vision of human dignity best embodied in the social teaching of the Catholic Church. To those willing to acquaint themselves with that, I recommend John Paul II's encyclical Laborem Exercens and the Compendium of the Social Doctrine of the Church.